An ideal book for very young dinosaur fans, the Mini Dinosaurs Triceratops pop up book has been cleverly designed and written in such a way as to help children from three years and upwards with their reading. It even features a big, blue Triceratops, this inclusion alone, will make this publication a firm favourite amongst budding palaeontologists. This book is part of a series, with each one of these hardback books featuring a different dinosaur. There is a Tyrannosaurus rex, a Stegosaurus and even one about the long-necked, giant Sauropod now known as Apatosaurus. It is to the publisher’s credit that they have chosen to explain why the dinosaur formerly known as Brontosaurus is now referred to as Apatosaurus, this demonstrates the writer’s commitment to ensuring that even these children’s books contain some factual content. The Mini Dinosaurs Triceratops book, is very colourful and each page shows a picture of at least one, blue Triceratops with questions about this horned dinosaur. The questions are just the sort of question that a curious three or four year old might ask, an example being “what did Triceratops eat?” On the page where this question is featured, the reader can then lift the flap which represents the mouth of this Late Cretaceous dinosaur and the answer is revealed. The words are written in a large, easy to follow black font. This font will help young children to recognise letters and words and to assist them with their reading. For the parent or grandparent that reads the book along with the child, the inside of each page flap that is lifted to reveal the answer to a question posed contains more information to help explain the answer given. So for instance, when the question about the diet of this particular dinosaur is asked the adult can read the additional information about Triceratops on the inside of the page flap and this can be used to help explain the answer to the young child. Although the book is small, it has been designed so that little hands can grasp it and turn the pages. The front and back covers have also been laminated, an excellent idea as this enables the book to be kept free from any sticky finger marks with just a wipe from a damp cloth. At the back of this little publication there is a large, paper Triceratops that can be created, simply unfold the Triceratops by pulling the body portion of the page towards you and folding down the legs. The fold out Triceratops model featured in the book. Have fun learning about dinosaurs. This is a very clever little dinosaur book about Triceratops, one of the most popular of all the dinosaurs, especially with very young children. It is set out in such a way as to help young children with their reading development and the fun questions and answers do have a basis in the knowledge scientists have about this horned dinosaur. No dinosaur fan’s model collection is complete without at least one Tyrannosaurus rex dinosaur model and there are so many to choose from these days. No self-respecting figure and replica manufacturer can introduce a range of prehistoric animal models without including this most iconic of all the Dinosauria, indeed a number of mainstream model makers have a number of Tyrannosaur variants on offer in their product ranges. One interesting example of a Tyrannosaurus rex model is the 1:40 scale model of the “Tyrant Lizard King” made by Collecta. Firstly, there is the pose. This T. rex is posed with its head bowed and with its mouth open showing an array of different sized teeth in the jaws. Most models of this Theropod dinosaur portray this animal walking with its head held high, sometimes with the tail dragging on the ground in a bid to balance the model. The Collecta model attempts to demonstrate behaviour, in our view aggressive behaviour, not necessarily towards another Tyrannosaur, where studies of extant animals such as bears and lions suggest that protagonists would try to make themselves as big as possible to deter a rival. The lowering of the head and the gaping mouth would be at or around the eye-level of a Ceratopsian, (horned dinosaur). The pose of the Tyrannosaur model by Collecta may reflect the sort of behaviour adopted by a Tyrannosaurus rex as it attempted to intimidate potential prey. Of course, this is just speculation, but it demonstrates that considerable thought and care has gone into this particular replica. The second impressive element is the size of the model. It measures nearly thirty centimetres in length, making this figure a relatively large dinosaur model, but one that can still be held comfortably by the hands of a small child. Each of the Collecta scale models is supplied with a little plastic figure, a model of a palaeontologist. This figure of a man, complete with pickaxe and binoculars, is known as “Sir Arthur Gauge”. The addition of the human figure allows the size of Tyrannosaurus rex to be appreciated, it provides a scale for the model. A clever way to provide a scale for dinosaur models. Another plus, is that the model is extremely well painted. The texture of the dinosaur’s skin is carefully picked out using various greens, mustard yellows and browns. Even the pupils of the eyes can be made out and the teeth have been painted individually. This is an excellent Tyrannosaurus rex model, a replica that demonstrates the care and attention of the design team at Collecta and it makes a fine addition to any dinosaur model fan’s prehistoric animal collection. Two new additions to the Schleich “Prehistoric Animals” model range, what we at Everything Dinosaur refer to as the “World of History range” are due out in May of this year. The company will introduce a replica of the Abelisaurid Carnotaurus as well as a model of Styracosaurus to go with the other horned dinosaur model (Triceratops) which is already in this particular range. Schleich had made models of these dinosaurs before, they were marketed under the “Saurus” brand before being retired some years ago. The two new additions are certainly more colourful than their predecessors. One of our team members managed to catch up with Schleich recently and took some pictures of these dinosaurs, which are not due to be released until the late spring. The Schleich Carnotaurus has an articulated lower jaw. It reminds us very much of the Carnotaurus that featured in the Disney film “Dinosaur” that we think was released in 2000. The second new model, the Styracosaurus is coloured a vivid blue with a brightly coloured head shield. The Schleich Styracosaurus measures approximately sixteen centimetres in length and stands around nine centimetres high. The Carnotaurus is slightly bigger measuring twenty-two centimetres in length with a head height of around twelve centimetres. Interestingly, 2013 marks the 100th anniversary of the naming of the genus Styracosaurus. Some fragmentary bones, including jaw material and teeth unearthed when a Peterborough clay pit (Peterborough in Cambridgeshire, England) was explored by the famous amateur palaeontologist Alfred Leeds, have been identified as a new genus of marine crocodile super predator. The fossils which include isolated teeth, elements of the mandible and some post cranial material, first excavated by Leeds as he examined Oxford Clay strata exposed at the Fletton clay brick pits close to Peterborough have been assigned to the species Tyrannoneustes lythrodectikos representing the oldest, large Metriorhynchid Crocodilian known to date. Although the actual size of this prehistoric, marine predator is hard to calculate accurately, studies of the teeth and estimates of the gape of the mouth indicate that this reptile was probably an apex predator and the fossil material helps palaeontologists to better understand the evolutionary path taken by marine crocodiles as they competed with other types of marine reptiles in the warm, tropical seas that covered much of England during the Jurassic geological period. The fossils were discovered around the turn of the 20th Century, they were first formally listed in 1919 forming part of the vertebrate fossil collection at the Hunterian Museum at the University of Glasgow. The material remained relatively undisturbed until a team of palaeontologists led by researchers from the Department of Geosciences at the University of Edinburgh had the opportunity to examine the fossil specimens in detail. The team concluded that the fossils represented a new species of giant, marine crocodile that swam in the Mid Jurassic seas around 165 – 163 million years ago. The newly assigned species, helps scientists to piece together a picture of the marine ecosystem during the Mid Jurassic, a time when Ichthyosaurs and Plesiosaurs shared this environment with the Crocodilians. The Metriorhynchidae are a large family of marine crocodiles that seem to have had their hey day in the Late Jurassic. Fossils of these predatory reptiles have been found in Switzerland, France, England, Germany and also in South America. These animals ranged in size from around two metres in length to apex predators that may have reached lengths in excess of seven metres or more. Dr. Mark Young of the School of Geosciences at the University of Edinburgh has studied a number of apex Metriorhynchidae Crocodilians, monsters like Dakosaurus and the much larger Plesiosuchus for example. However, such large members of the Metriorhynchidae are associated with more recent Late Jurassic strata whereas, the fossils ascribed to Tyrannoneustes date from earlier Mid Jurassic deposits. This new research, which has just been published in the academic publication “The Journal of Systematic Palaeontology” allows scientists to partially fill a gap in the evolution and radiation of the Metriorhynchidae as these creatures evolved into top predators from smaller genera that specialised in catching fish and cephalopods. The wide gape of the mouth and the teeth capable of shearing flesh and bone would have made this marine crocodile a formidable hunter, the fearsome nature of this beast is reflected in the scientific name Tyrannoneustes lythrodectikos, which means “blood-biting tyrant swimmer”. The research team are confident that this fossil material represents a transitional stage in Metriorhynchid evolution between smaller crocodiles feeding on small prey and other, later forms that filled an ecological niche in a similar way to modern-day Orcas. Intriguingly, other isolated teeth and a partial humerus found in Oxford Clay deposits suggest that at least one other genus of large, marine crocodile may have been present in the tropical seas around 165 million years ago. In response to requests from customers we are publishing further information on the size of the new Collecta 2013 prehistoric animal models. There are going to be a number of new additions to the Collecta “Prehistoric Life” model series this year, both within the company’s deluxe scale model range and within their not to scale figures. In addition, the Tyrannosaurus with prey (Struthiomimus) model is having a base fitted. This will make the original T. rex with prey model that was launched last year a rare collectible in years to come. Those clever people at Collecta have fitted a base to this model that allows it to fit with the bases that can be found on the Williamsonia and the Monathesia and Cycadeoidae tree models. It looks like 2013 is going to be another exciting year for Collecta. 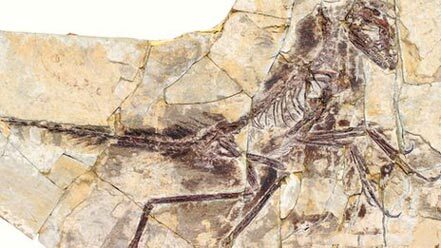 A single, thirty centimetre fossil of a dinosaur from China is helping palaeontologists to understand a little more about the complex evolutionary path between the Dinosauria and Aves (birds), the fossil, representing a new genus of basal Troodontid has been named Eosinopteryx brevipenna. This dinosaur lived in a swampy environment with plenty of tree cover. The discovery of this fossil increases the known diversity of small-bodied, feathered dinosaurs that lived during the Mid to Late Jurassic and shows that a number of different taxa of feathered, mainly cursorial dinosaurs occupied different niches in dinosaur dominated ecosystems suggesting that the evolution of flight and ultimately the Class Aves is much more complex than was thought some twenty years ago. Archaeopteryx (A. lithographica) may be regarded as a transitional fossil between the Dinosauria and true birds, but it seems that the Late Jurassic feathered dinosaur from finely grained limestone deposits of Solnhofen in Germany may only represent one of a number of dinosaur lineages that had feathers. This new fossil discovery comes from the Tiaojishan Formation of western Liaoning, a Province in China. The strata of the Tiaojishan Formation has been dated to around 165 -155 million years ago (Early Bathonian to Mid Oxfordian faunal stage). The specimen represents an adult or possibly a sub-adult specimen and an analysis of the well-preserved fossil shows that this little dinosaur had a short snout, quite large eyes, small arms covered in short feathers and toes suited to running (cursorial lifestyle). E. brevipenna had fewer feathers on its tail and lower legs, these adaptations would have made it easier to run. It can be speculated that this feathered dinosaur probably hunted insects, lizards and small mammals in the undergrowth. An anatomical study of the bone structure of the arms of this reptile suggest that it could not fly, the feathers may have aided the animal jumping from logs and other obstacles, perhaps acting as mini air brakes to help control landing. The genus name Eosinopteryx means “Early Chinese Feather”. Helping to unravel the evolution of flight. The team’s findings suggest that the origin of flight was much more complex than was thought twenty years ago, with there being a lot of evidence to suggest that there were a number of feathered, cursorial dinosaur genera present in the Mid to Late Jurassic. Interestingly, the rocks of the western part of Liaoning Province have provided a substantial number of Pterosaur fossils. In this part of China towards the end of the Jurassic there were a lot of reptiles that were very accomplished fliers – members of the Pterosauria. One such genus is Darwinopterus (named after the naturalist Charles Darwin). Known from around forty fossil specimens including one that showed an egg about to be laid but still present in the animal’s body, this Pterosaur genus shows important anatomical characteristics that suggests it may be a transitional form from the primitive Rhamphorhynchoid Pterosaurs to the more advanced, shorter-tailed Pterodactyloid Pterosaurs. Liaoning Province may be famous for its feathered fossils representing creatures from the Early Cretaceous but it also seems that the older strata of this part of China can lay claim to a number of feathered dinosaur fossils too. A South American Caiman abandoned outside a pet shop in Wolverhampton back in December 2011 has fully recovered from her ordeal, found a new home and even found love in her crocodile enclosure. Nick-named “Snappy” when discovered left outside in a plastic box by pet shop owner Jim Wick, the crocodile has been renamed Edith by keepers at Cleethorpes Jungle Zoo who took her in when they heard of her plight. Unfortunately, there remains a sizeable trade in illegal, exotic pets such as crocodiles. These dangerous reptiles do not make good pets, they require very specialised care and even a small crocodile such as Edith would be capable of inflicting serious injury should she get close enough to bite someone. With the economic downturn, Jim, the owner of a specialist pet shop called Wickid Pets had taken in a number of exotic pets as their former owners no longer wanted to or could afford to look after their charges. Craig Gledhill, the manager at the zoo where Edith now lives is very happy with her progress. He stated that although she had a bossy and fiesty side to her character she has settled down well and is a popular attraction. The one metre long crocodilian has even found a mate , a male called Colin who shares her enclosure. It is very pleasing to hear that what was a very sad story when we first reported on this crocodile’s plight has had a happy ending, but we must stress that the keeping of exotic pets is not to be taken on lightly. One of the most formidable predators roaming around the land mass that was to become Europe in the Mid to Late Triassic was the mighty Batrachotomus. With a strong set of jaws, lined with backward, curved teeth which were serrated this prehistoric beast was over six metres in length, this makes the extinct Batrachotomus about the size of the modern, extant Nile Crocodile (Crocodylus niloticus). This Triassic carnivorous reptile was a member of the Archosaurs, the same group of reptiles as the Dinosaurs, but it was not a member of the Dinosauria. Instead, Batrachotomus has been assigned to the Prestosuchidae Order, although palaeontologists debate the exact taxonomic relationship between the Prestosuchidae and the Rauisuchidae Order. However, most scientists ascribe the fossils of Batrachotomus (B. kupferzellensis) to the family known as Rauisuchia. What is not debated is that the majority of these animals were highly evolved, efficient terrestrial predators with a more efficient gait than modern-day crocodiles. Batrachotomus and its close relatives such as Prestosuchus and Saurosuchus had special hip and shoulder joints that enabled their limbs to be positioned directly under their bodies. This was a much more efficient method of walking around compared to other reptiles which had their limbs to the side of their bodies and walked with a sprawling gait. The back legs of Batrachotomus were longer than the front and although it probably spent most of its time walking on all fours, if it needed a sudden turn of speed, or to lunge at prey it was capable of standing on it’s back legs, being balanced by its long, muscular tail. These types of animals rivalled the first, large Theropod dinosaurs for the position of apex predators in the Mid Triassic. Fossils of animals ascribed to the Rauischia family have been found in Germany, other parts of Europe, Brazil, North America and Asia. A fully grown, adult Batrachotomus is estimated to have weighed more than one metric tonne. It would have preyed on other reptiles such as Aetosaurs (eagle lizards), Pterosaurs, and Dinosaurs. Scientists are still debating just how closely related Batrachotomus was to the group of reptiles known as the Order Dinosauria, it did belong to the same group of reptiles – the Archosaurs, but just how closely related it was to the ancestors of the dinosaurs is still hotly debated. The fossil record for predators in the Mid to Late Triassic is particularly poor. Indeed, with relatively few fossils being preserved from this period, the ancestry of the Dinosauria and their development is still unclear. One of the most iconic prehistoric animals associated with the periods in geological history known as the Ice Ages is the Woolly Rhinoceros, a large, shaggy coated rhino that lived in Europe from approximately 500,000 years ago to around 10,000 years ago (Pleistocene to the beginning of the Holocene epochs). Papo, the French model and figure manufacturer, are about to introduce a new model of a Woolly Rhino into their highly acclaimed prehistoric animal model range. Having had the chance to view the model up close, it is clear that this new interpretation of Coelodonta antiquitatis elevates Woolly Rhino model making to a higher plain (or should that be higher plateau – see below). There were in fact several species of prehistoric rhinoceros that lived in Europe during the Pleistocene epoch, although the ancestors of the two-horned Woolly Rhino (Coelodonta antiquitatis) are believed to have migrated across the continent from Asia, having originally evolved on the Tibetan plateau. The fossilised remains of Woolly Rhinos have been found all across Europe, including southern Spain, however, no fossils have been found in Ireland or North America so it seems these grazers did not reach the American continent or indeed the Emerald Isle. A number of very well-preserved carcases of these prehistoric mammals have been discovered in the higher latitudes of Russia during the spring thaw which leads to flooding in some areas and the subsequent erosion which exposes the animal remains. So numerous were these animal remains and so strange the preserved horns of these rhinos, that up until the late 19th Century many of the native people thought that the horns were actually the talons of a giant bird. The large, anterior horn (the one on the tip of the nose), of C. antiquitatis does not resemble the horn found on extant species of rhinoceros. The horn is much longer. the largest horns belonged to males and could grow to over two metres in length. Like modern rhinos, the two horns of Coelodonta were made of keratin (compressed, fibrous hair). The horns would have been very effective weapons used in self defence against attacks from creatures such as the European Lion (Cave Lion – Panthera genus), however, fossil evidence suggests that the anterior horn was not pointed but had a spatulate or keeled appearance. Scientists believe that the horn of the Woolly Rhino got its strange, keeled shape as the rhino grazed moving its head from side to side wearing the sides of the horn down. The Woolly Rhino may have also used this horn to clear snow in order to find food. This prehistoric mammal, the largest of which could weigh up to two thousand kilogrammes could have had its own built-in snow plough. Great care has been taken to depict the anterior horn on the new Papo model. A number of cave paintings depict Woolly Rhinos, the long shaggy coat and the short tail can be clearly made out in a number of the better preserved examples of Stone Age artwork. The very last Woolly Rhinos were to be found in Western Siberia. The demise of these large herbivores was probably due to the retreat of its glacial habitat and rapid climate change. As the Woolly Rhino had co-existed with both modern humans and Neanderthals for thousands of years it is unlikely that hunting caused its extinction. Just as our ancestors depicted Woolly Rhinos with their cave art, so today’s model and figure manufacturers are keen to capture the beauty and power of this Ice Age icon. A number of models of Woolly Rhinos have been produced but the latest introduction to Papo’s “Dinosaures” range of prehistoric animal figures sets new standards. For example, not only is the French manufacturer’s new model extremely well crafted, the anterior horn on the model shows the spatulate, keeled shape suggesting that the design team have extensively researched the data on Woolly Rhinoceros fossils.